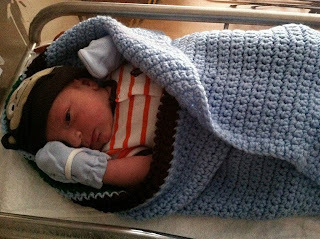 August began in anticipation of a new life in the form of a baby boy . Little did we know that he would make us wait until nearly at month's end . Kai came into this world on his terms , not ours . August held many births and beginnings . I joined a Chronic Illness Support Group . Emily went from Register Girl to teacher in Sunday School , a Greeter and Resource Center desk volunteer . A crocheting club was formed and a blog revived . August held a surprise or two , with my chemo treatments being extended once again and my boss complimenting me on a job well done . The latter more of a shocker than surprise . August was a slow month at work with two company shutdown days . We haven't had any of those in two years . There were many a long , boring , slow nights at work . If you ask any individual what they desire more than anything in life , I bet their answer will be to live in peace and serenity . We all strive to achieve the perfect harmony in our life . Sometimes , we even pretend that we have it . Why is it so difficult to achieve ? I believe because we are looking for instant happiness . A little pill that can transform our dreary , broken heart into an instant rose colored glasses outlook . That's why new age religion is so appealing to people . . . . instant gratification . I can remember my mentor relating how she first accepted Christ . In her darkest hour , she ran out into the street in the middle of the night crying to God to help her somehow if He truly was there . The same week , she received in the mail an invite to our Church . When I was a baby Christian , I had a real hard time believing people when they would say God spoke to them . I would wonder just how God spoke to them . How did they know it was from God ? I just couldn't understand what that entailed or what form it took place . Over the past few years , as I grew in the Bible , so did my understanding . I believe that God approaches each of us in different ways . It could be in a dream , an intuition or series of events or other ways . For me , it always starts with an idea and I may write about it or mention it to someone . Suddenly , this idea develops a life of it's own and grows beyond my expectations . I have no control over how quickly it spreads . This is what happened with The Crocheting Ministry Club . I had an idea and I shared it here on this blog . Now , God knows that I am a procrastinator , so He took matters into His own hands . Lately , the burning question of my health status is on everyone's mind . Where am I at regarding my health ? Well , my health status hasn't really changed at all since the last time we spoke . This is the first time that my treatment has become an ongoing one and that has everyone concerned . In the past , I would undergo my six treatments and end up in remission immediately after . That is not the case anymore and that has people wondering something is going on . We have to remember that my cancer only grew three centimeters and that is the normal size of growth for me . I think that because I have regular , scheduled appointments and tests , any irregularity is taken cared of right away . A few days ago , Kathy gave birth to a son named Kai Avery and I fell in love . I held him . I smelled him . I caressed him . I whispered to him . He has awakened a desire deep inside of me that I thought was long buried . I love children and they seem to reciprocate the feeling . I think this passion I share for them exists because of my past . You see , I never had my last child , or the experience of having my last child . My second and fourth child , both sons , never lived past the age of five months and one month . Since then , I literally melt when I see a baby . So after meeting Kai for the first time , I went home and sent pleading messages to my two adults children to provide me with a wee baby grandchild . Of course , I got the usual " someday " remark I always get which sent me into a pouting , angry mood .
" What are they waiting for ? For me to die ? I'm on borrowed time as it is ! " To say that I love wine is an understatement , but it wasn't always the case . Alcohol of any kind never suited my palate . I'm not exactly sure if it was my illness or Kathy's winemaking , but during these past few years , I can't get enough of red wine . Now . . . . . . before I go on , this isn't an advertisement for excessive drinking or addiction . In fact , too much of anything isn't good for us . 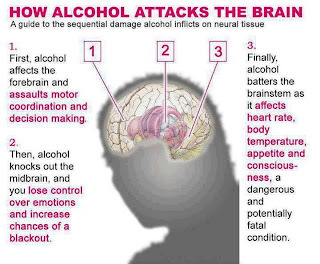 Here's a few facts on alcohol and what it does to us if we drink excessively . Ahhhh , that first cup of the day . It tastes great , doesn't it ? It hits that spot just right , where you start feeling like you might be able to face whatever is coming your way that day . There's nothing like a good cup of java . That's only true if we get to actually drink that hot cup of coffee . For me , I rarely get the chance to sit down and drink it hot and fresh . The phone rings or someone is vying for my attention and in the meantime , the coffee becomes cold and uninviting . For that reason alone , I don't drink coffee at work . A time does come when we sit down and enjoy that tasty brew . Where we close our eyes , inhaling the aroma of pure , sweet coffee . That first sip bringing echoes of deep resounding sighs of pure tasty pleasure . Every Monday , when I come into work , the first thing I do is print out the schedule at a glance . On this piece of paper , usually three pages long , is a list of all the cosmetic goods I need to produce so it can be shipped out to the representatives . Everything I need to know is on that paper : The amount of people I will need : How many pieces of each item needs to be made : What priority each item has over the others . Over the remainder of the week , I'll be checking that schedule frequently . Recently , my DIL Aubrey , made a schedule plan of her own of a routine she wanted to follow . After seeing her plan , I thought of myself and how this could be something I could use for my activities . By doing so , one has a guideline in case we get sidetracked by other things . Being pampered is not something I'm really accustomed to , spending majority of my youth scrimping and saving . Manicures , pedicures and facials all were done at home versus the salon . An occasional visit to get a haircut was all I allowed myself . It seems the younger generation has this down pack , frequently visiting salons and experiencing the art of pampering . Believe me , I'm not criticizing , but stand in awe of how body conscious they are of their own so early on . They are taking care of themselves with a little of preventive pampering . I wish I was that smart when I was young . The older I get , the more pampering I need and desire . Our bodies start hurting in places we didn't even know we had . Many of times , I've come home with shoes in hand , limping and wincing straight to my bed . Didn't I say I've been craving some pampering ? After deciding I needed to take a break to refresh and regroup my soul , I started looking around for some great reading material to sink my teeth into . It's been a long time since I had a real Bible Study and my thirst was more evident than ever . First , I asked myself what did I want to gain from this retreat ? This break ? Then I remembered some material I read regarding accountability . These next four things were needed in order for us to be held accountable for our actions . 1. Vulnerability—capable of being wounded, shown to be wrong, even admitting it before being confronted. and respond to reproof , being open to counsel . 3. Availability—accessible, touchable, able to be interrupted. Every Sunday before Church , we arrive early and while Emily goes inside , I hang out in my car drinking coffee until the service begins .
" Are you being anti-social ? " It really struck a cord with me , because she was right , I was trying to avoid the social scene before and after Church . Why ? I could give you the usual excuses , but they would be just that . . . . excuses . I believe the real reason is because I crave " me " time . I really like the alone time that being a hermit provides . All week , especially at work , people come at me from all angles . At home , there are issues as well . There is my blog , my crocheting ministry , the sunday school and on and on . It never ends . As I have arrived to this current roadblock on my path in life , my first reaction was to completely shutdown . My soul filled with anger , bitterness and disappointment at everything surrounding this thing called " my life ". The rose colored glasses lay on the ground , broken and covered with thorns .
" people " would enter . I wasn't leaving this apartment where others could hurt me , not even for church . I questioned the existence of this blog , its worth and its substance . I questioned whether I could even consider myself a writer . Did I really have anything to say that was worth hearing ? Was anyone even reading ? There comes a time in our life where we question our purpose and goals we've set before us . A time where we wonder if we are surrounded by the right people in our midst . A time when we question our wisdom in the decisions we've made . A time where we consider the ties we've made and the ties we need to break . Have I stayed on track or veered off into a ditch ? All things come to an end , whether they're good or bad . All of my life , I've wanted to blend into the wallpaper , observing and not participating . Others have craved the spotlight and I've craved the hidden corner in the back . The more I'd creep into that safe haven of unknown oblivion , the greater the shove at my back , thrusting me forward into the light . God has other plans for me . I'm sure all of you have been wondering what has been going on with this blog since I haven't posted anything for almost two whole weeks . I felt like I needed some time off to regroup and take a very hard look at where I was going with my life . I felt so out of place as if the footsteps I was walking in weren't any longer meant for me . The path I was on led to a roadblock . Taking a look around into the crevices of my life , I realized it was time to forge a new path . During that first week , I sat still , crocheting my little heart out . I felt spent and tired . As the days went by , an idea started taking shape and it grew bigger as the second week approached . During that second week , the idea turned into action and I knew what had to be done . Rolling up my sleeves , I set to work . I felt revived and restored , ready for what God had in store for me .